The FootJoy DryJoys HydroLite FJ rain pant features the HydroLite System which combines lightweight fabrics with the Sta-Dry system to create the lightest performance rainwear ever produced by FootJoy. The FJ HydroLite pant has an elastic, gripper waist band for comfortable non-slip performance and the Velcro® Pant Bottom and seam sealed design helps you stay comfortable in wet and windy playing conditions. FootJoy warrants that this piece of outerwear will be waterproof in normal use for two years (U.S. Warranty). >>Elastic waistband with Gripper waist technology ensures a comfortable non-slip fit. >>Seam sealed for complete waterproofing. 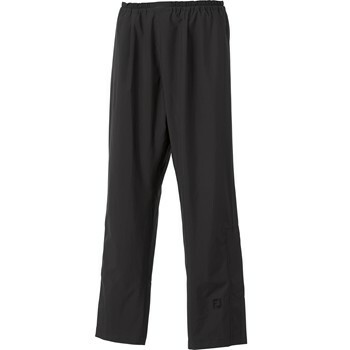 >>Extra-long 5" Velcro® pant bottom allows for easy adjustment and alteration. >>FootJoy warrants that this piece of outerwear will be waterproof in normal use for two years (U.S. Warranty).